Could a natural shape like this have originally inspired the Mexica to design their symbol in this way? In Nahuatl, yacatl (nose) + metztli (moon[crescent]) = yacametztli or ‘nose crescent’. Several pages from the post-Hispanic Codex Magliabecchiano depict the deities of pulque (the alcoholic drink derived from maguey juice, so popular among the Mexica); all wear the yacametztli nose ornament, and nine also have this same insignia on their shields. 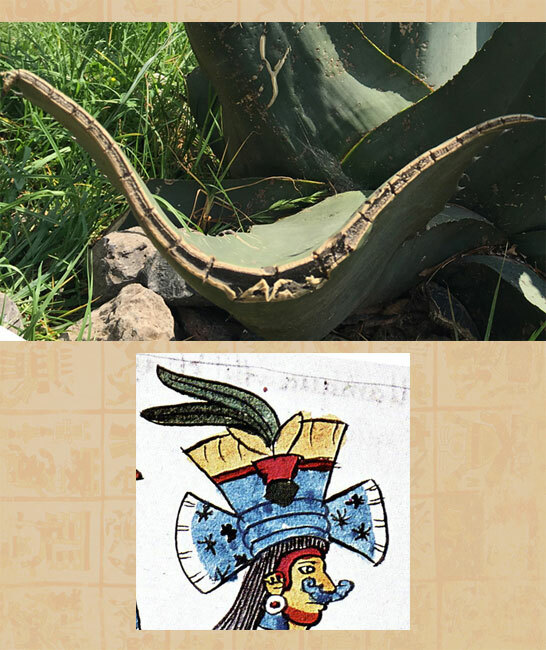 The goddess Mayahuel, discoverer of the maguey, wears the nose ornament on folio 58r (see lower pic, right). 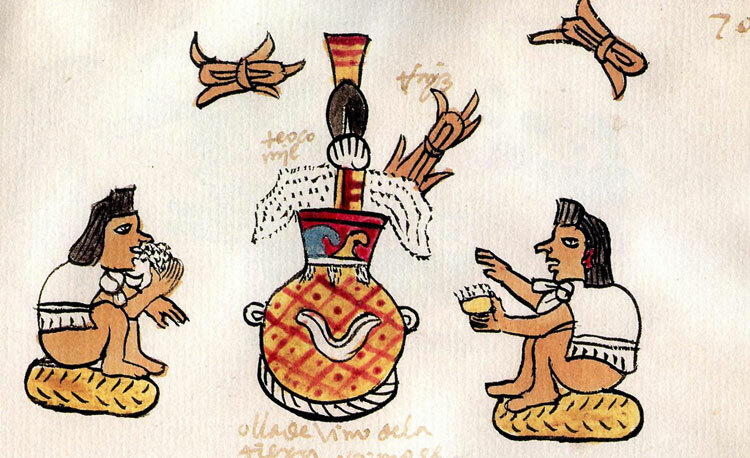 Foaming pulque containers and vessels, many displaying the yacametztli symbol, are shown in several codices, including the Codex Tudela, fol. 70r (see pic, left). Editor’s note: Info on Nahuatl and the Codex Magliabecchiano from The Codex Mendoza by Frances F. Berdan and Patricia Rieff Anawalt, Uni of California Press, 1992, Vol. II, p.171. Image from the Codex Tudela scanned from our own copy of the Testimonio Compañía Editorial facsimile edition, Madrid, 2002. I forgot to mention another lunar association between the maguey plant and the moon. Located within the core of the plant is found a round “cajete” (container). This globe resembles the white full moon, both filled with delicious liquid. The maguey with honey water, materia prima for the pulque. While the moon herself was an astral cajete filled with pulque, the already fermented honey-water.